Samia Mooney, a Santa Clara Vanguard color guard member, sent this picture. A 2006 horn player received these as a gift from his mom. 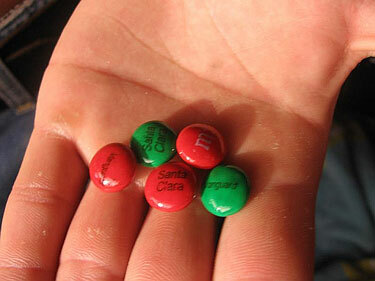 These specially made M&Ms that say "Santa Clara" and "Vanguard" on them. They are only red and green in color. My two favorite things: SCV and chocolate!